The Rosary is a Catholic form of prayer using beads. It is a cycle of repeated formal prayers, such as the Lord's Prayer and the Hail Mary, done while thinking about important events in the lives of Jesus and Mary. This is called "saying the Rosary" or "praying the Rosary." 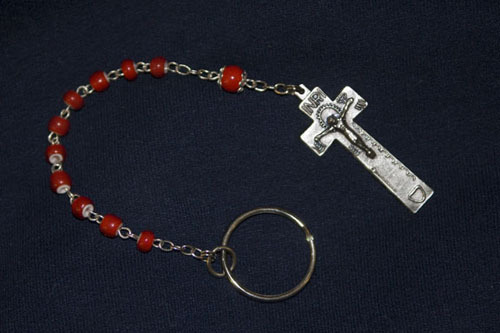 A rosary can also be the series of joined beads that a person holds while saying these prayers. A person who says a Rosary usually thinks about certain events from the Bible. Each day has a traditional list of these events, called "Mysteries of the Rosary." Rosary Facts for Kids. Kiddle Encyclopedia.